Aja Monet is a poet, committed activist, and musician and was an NAACP Image Award nominee for Outstanding Literary Work-Poetry in 2018. Harry Belafonte has called her "the true definition of an artist." She was a featured speaker at the Women's March on Washington, where she read the title poem of her latest book, My Mother Was a Freedom Fighter (2017). Monet's other books include Inner-City Chants and Cyborg Cyphers (2015) and The Black Unicorn Sings (2010). The youngest individual to win the Nuyorican Poets Café grand slam title, she has performed around the world, including in France, the United Kingdom, Austria, Belgium, the Netherlands, Bermuda, and Cuba, as well as at the NAACP's Barack Obama inaugural event in Washington, D.C. Passionate about education as a tool for liberation, she has been a teaching artist for Urban Word NYC and the Urban Arts Partnership. Reflecting on the renewed activism of our current moment and the role poetry has played, Monet states, "There [are] many moments that we are participating in right now, as black people in this country, that [are] causing us to start to rethink ourselves and how we talk about who we are. I feel like there have always been poets. Now there's a lane, there's more interest. The public is ready to deal with those poems in a way that they weren't before." 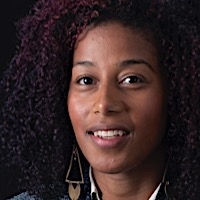 Of Cuban/Jamaican descent and Brooklyn-born and -raised, Monet is a graduate of Sarah Lawrence College, where she was awarded the Andrea Klein Willison Prize for Poetry, which was established to recognize undergraduate students whose work in poetry "effectively examines relationships among women, especially in the context of justice for everyone." She holds an MFA in creative writing from the School of the Art Institute of Chicago. She lives in Miami.